Crafts in the Park is starting up again! We’re super excited to announce that Crafts in the Park are starting up again! Every Thursday starting July 5th, the Whistler Museum and the Whistler Library will be hosting fun and free craft activities in Florence Petersen Park from 11 to 12 am. Kids of all ages can learn about Whistler’s history, enjoy a story, and get creative with one of our amazing crafts. Our theme this year is “Whistler Through the Ages”. People have been coming to Whistler for over one hundred years in the pursuit of seasonal fun- from the first visitors to Rainbow Lodge in 1914, who came out to ride, fish, and sail, or the crowds that gathered in 2010 to cheer on the Olympic athletes. Our crafts this year are based on activities enjoyed in Whistler past and present. The first settlers in Whistler came here to hunt and trap animals for food, and for their furs. We’ll be making multimedia animal collages, using foam, felt, paper, magazines, tissue paper, fake fur, and more. Whistler has an amazing variety of wildlife (bears, squirrels, and everything in between) so what animal will you make? Alta Lake became a popular fishing destination in 1914. People caught fish of all kinds. Just like those early tourists, we’ll be making our own mini fishing rods and fish. You’ll even be able to catch these fish with your rod. Design these fish however you want – rainbows are never a bad idea! For this craft, we’re collaborating with the Squamish Lil’wat Cultural Centre. We’ll learn about the relationships between animals and people in Pacific Northwest First Nations culture, and the ways we can identify with animals to understand the world around us. The children will make their own animal headdresses, and participate in a drumming song. Sailing has been popular in Whistler since its early days and Alta Lake residents enjoyed taking all kinds of boats out in the summer. We’ll be making our own sailboats out of sponges, corks, and paper. Just like real boats, these really float, and you’ll even get a chance to try them out on the water. Rainbow Lodge at one time had a stable of 20 horses, and many visitors enjoyed trail rides and trail picnics during their stays. We’ll be making cut-out paper horses with moveable joints. Though you can’t take these horses out for a ride, they’re a fun, poseable homemade toy. And although Whistler’s never been home to any unicorns (as far as we know) you can go ahead and make one of those too. Whistler boasts several beautiful golf courses and this craft is a fun spin on one of Whistler’s favourite sports. We’ll be making kinetic golf ball paintings, using golf balls to roll the paint across the paper. These painting are fun to do and look even cooler. Skiing began in Whistler in the early 1960s and has been wildly popular ever since. We’ll be making paper doll skiers and snowboarders, and using paper and fabric to dress them up warmly against Whistler’s freezing winters. Whistler was proud to host the Olympics in 2010 when Canada won gold on home turf for the first time. We will be making our own personalized Olympic medals using foam stamp printing and metallic glitter. Win gold in your favourite sport, or even make up your own! So come out and join us at Crafts in the Park, every Thursday from 11 to 12 in Florence Petersen Park! Today marked the end of “Crafts in the Park” for the summer of 2017. Every Friday for the last seven weeks, the Whistler museum got together with the Whistler Public Library to host a fun story time and craft activity. This was the fourth year running the event, which will be sure to continue in summers to come. The Whistler Museum and Public Library team up in Florence Petersen Park for fun Friday crafts. Each year has a new theme, and this year’s theme was, “A Journey Through Whistler’s History”. Our crafts travelled from hundreds of years ago with the First Nations, all the way to the 2010 Winter Olympic Games, with crafts to match each point in history. The first week was extra fun, as we joined up with the Squamish Lil’wat Cultural Centre, to make traditional First Nation’s dreamcatchers. For week 3 we built our very own Rainbow Lodges, just like Myrtle and Alex Philip back in 1914. Although, ours were built from rainbow coloured popsicle sticks, and weren’t big enough to live in. This girl made the roof of her lodge extra special. We never ceased to be proud of how each child’s unique craft turned out. Week 5 was “Fun with Fishing”, which had to be held inside due to the dense smoke in Whistler. However, the craft was still one of the favourites as the magnetic rods actually stuck to the metal mouths of the fish! Some of the other favourites included, “Beaver Builders”, “Giddy Up Horsey”, and “Travel by Train”. This little girl come almost every Friday, and loved how the cute little beaver could actually fit into his beaver dam. Three kids proudly showed off their horse crafts. They could stand on their own! Each hour began with a couple interactive stories read by Julie Burrows from the Whistler Public Library. This was followed by a short history related to the theme, and an explanation of the craft by Sierra from the Whistler Museum. The kids would then get to try out the craft for themselves. Besides week 5, we were lucky to have nice weather almost every Friday. We usually had about 21 kids, and they all seemed to enjoy both the outdoors and fun activity. Sometimes the kids would add their own touches to the crafts and make them even better and more exciting than we planned for. We even had some kids who showed up every week, always excited for another craft. Parents were always keen to help their child out, sometimes doing much of the craft themselves. (Many of them seemed to enjoy it more than they might admit). See you in 2018 for another summer of Crafts in the Park! Portable buildings are not a new or uncommon phenomenon in Whistler. Since the formation of the municipality many civic and social institutions have been housed within these portable buildings, shifting, adding and removing spaces as the community has grown. Before the construction of the village, Whistler’s bank, liquor store and post office operated out of trailers (leading to one of the most straight forward bank robbery attempts – hitch it up in the night and drive away). The Whistler Health Care Centre also began in a trailer located at the base of Creekside. In the 1990s some municipal departments were located in trailers outside Municipal Hall and before the opening of Spring Creek Elementary in 2004 Whistler’s growing population meant that more students at Myrtle Philip Community School were taught in portable classrooms on the school grounds than inside the building. Here at the Whistler Museum it’s natural for us to have an interest in the histories of these scattered portables; after all, we call one of them home. The current space occupied by the museum began its journey in Whistler as the Canada Post building. After the post office moved into its current location in Market Place in 1993 the trailer sat empty until its revival in 1995. In 1994 the Whistler Public Library was searching for a new building as the lease on their space in the basement of the municipal hall was nearing its end. After examining several options the library board decided that the WPL would move into the old Canada Post trailers that would be moved to Main Street (at the same time the museum moved into an adjacent trailer on the current site of Florence Petersen Park). When Canada Post had vacated the trailers they had left behind the counter and cupboards. These were reconfigured to be used in the library and for the thirteen years in which the trailer housed the library the circulation desk bore the colours of Canada Post. The library operated out of this trailer from January, 1995, until its move up the road to its permanent building in January, 2008. Locals coming into the museum today may remember attending story time where our offices now sit and can wander through our exhibits as they once wandered through the stacks. The trailer in its current setting in Florence Petersen Park. After the library moved the Whistler Museum took over the building in 2008. Some major renovations were needed to rework the space (time had not treated the portable well; carpets needed to be removed and leaks addressed, as well as more structural and cosmetic changes) but by the end of 2009 this trailer had reopened its doors in its third reincarnation. The removal of the adjacent trailers, the addition of a large mural and the development of Florence Petersen Park have made the space almost unrecognizable as the former library parking lot. To those who have not yet visited, though, the washrooms might still seem eerily familiar. Tomorrow, July 8th marks the beginning of the Whistler Museum’s Crafts in the Park event series. This year the theme is “How do you connect to Whistler?” and each week we will cover a different aspect of what brings us to Whistler. This could be nature, history, activities and even transport. Each week we will begin with a story and information activity under the story tree and then create a craft together. This year we will run seven of these in total, and each session will highlight a different aspect of what connects us to Whistler. They begin at 11am and go until noon. It is a drop-in program open for children ages 4-12 with a caregiver present. Crafts in the Park will be held in Florence Peterson Park, which is behind the Museum and Library. 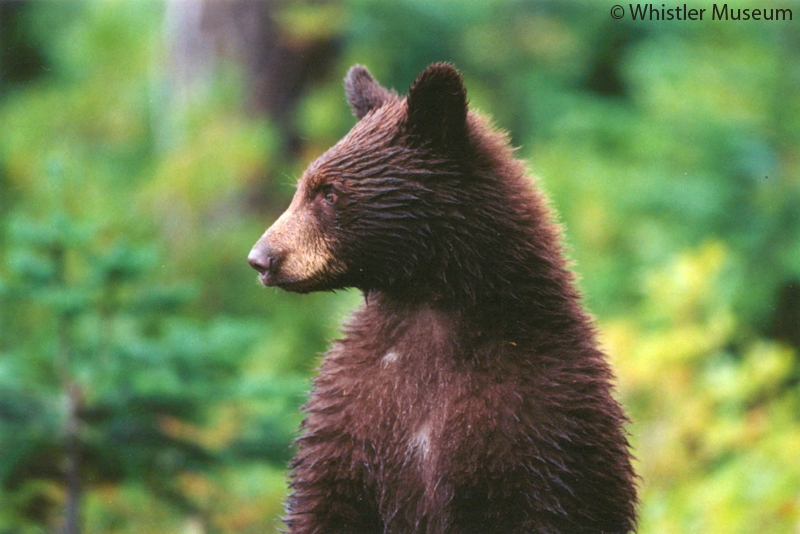 July 8 – This week will be oriented around nature, specifically the bears that are so popular in the area. The craft will be a foam bear mask, and the kids will have a choice to make either a black bear or a grizzly bear. Myrtle Philip and Teddy the bear. July 15 – This week will be a collaboration between the Museum and The Squamish Lil’wat Cultural Centre so that the kids can learn a bit more of the First Nations history and the pioneers. The craft is being provided by the Cultural Centre and is a cedar rope bracelet. July 22 – This week focuses on transportation in the early days of Whistler. One of the first methods that made visiting the area easier was the Pacific North-West railway, so this week’s craft will be a cardboard tube train engine. July 29 – To celebrate Whistler’s history as a ski town and its hosting of the 2010 winter Olympics, week four’s craft is a clothespin skier. August 5 – Since there are so many activities to do in Whistler and each person enjoys different ones for various reasons the fifth week of crafts will be a screen-printed t-shirt that each child can design and themselves. August 12 – While Whistler is known for its winter sports, in the summer mountain biking takes over the town. This week the children will get to make a pipe-cleaner bike and a mountain pass made of cardboard. August 19 – For our final week of crafts the kids will be making a mini replica of the Peak2Peak. To symbolize the coming together of Whistler and Blackcomb mountains that helped Whistler become what it is today. 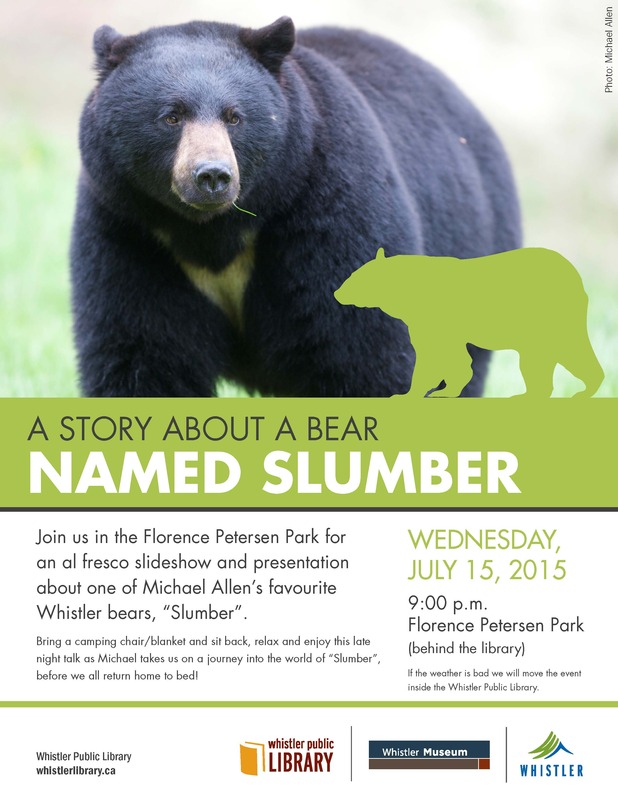 Come out to Florence Petersen Park this Wednesday night to experience a slideshow and presentation by local bear expert Michael Allen about one of his favourite Whistler bears, Slumber. The event starts at 9pm, and is free to attend. Be sure to bring a chair/blanket to sit on, and enjoy this journey into the world of Slumber.